I can honestly say that the "bat" pillow is the first real throw pillow I have ever made. I didn't have a lot of throw pillows, because, honestly, they're just one more thing the kids can throw around. But, I have become enamored with the art of the throw pillow. They are small, simple (relatively) sewing projects that don't take a considerable amout of time to complete (mostly). 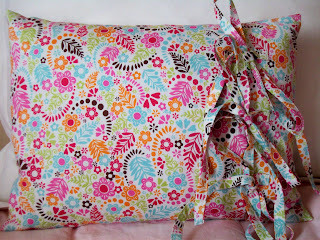 When my friend commissioned me to make some pillows for her daughter's bedroom, I was ecstatic! What fun! These are the three we came up with. The two square pillows are 12" X 12" and the longer one is 12"X16". We shopped for fabric together and I think we came up with a pretty sweet combination. This is one of my favorites! (who am I kidding, I love them all!) I LOVE this fabric. We bought the rest of the bolt (there was less than 2 yards). 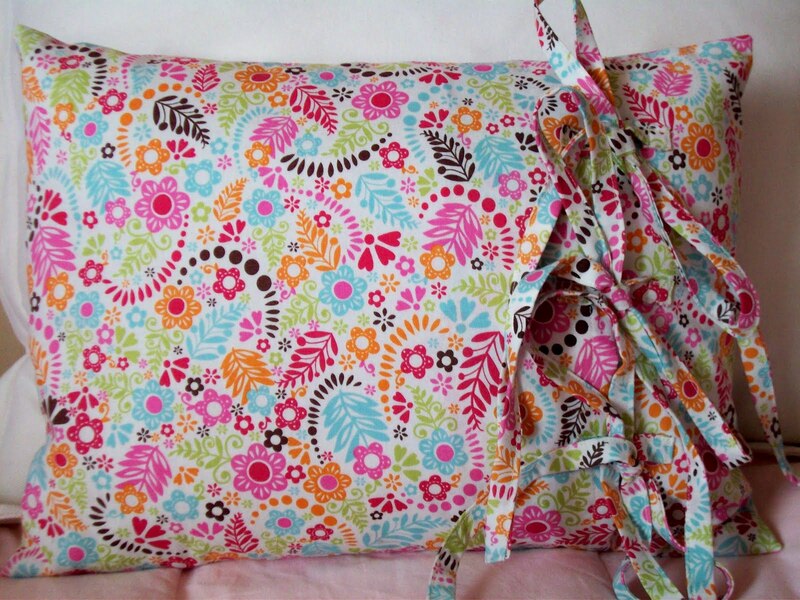 I wanted to keep the pillow relatively simple so the fabric would shine. 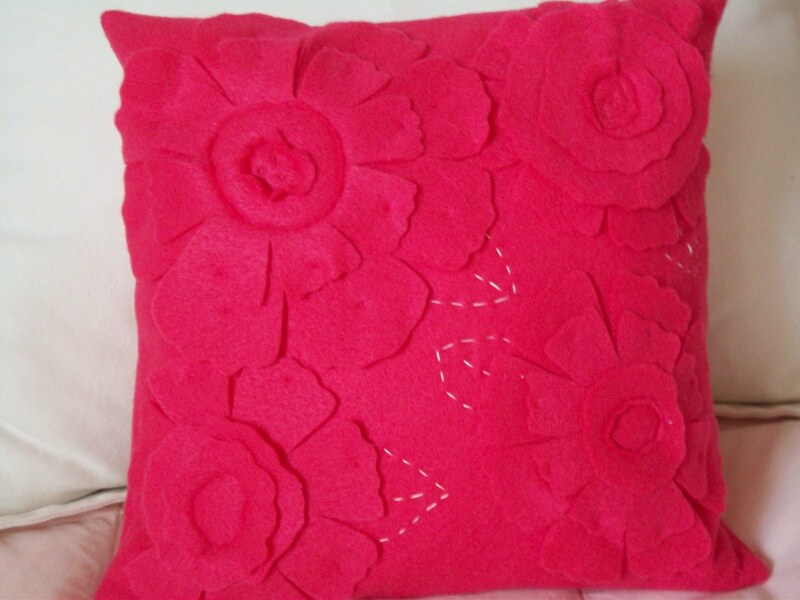 I made an envelop closure pillow, but kept the closure on the front and used the ties as the decorative element. Yummy! This pillow is a copy cat of the original inspiration for the bat pillow. It is from the Pottery Barn catalog. I love the tone on tone of the felt. There's enough texture to keep it interesting, without being overwhelming. Delicious! As I'm typing this, my almost two year old said "cute pillows mommy!" I wish you could hear her little baby girl voice. Melts your heart. I guess if she approves, what other accolades do I need? 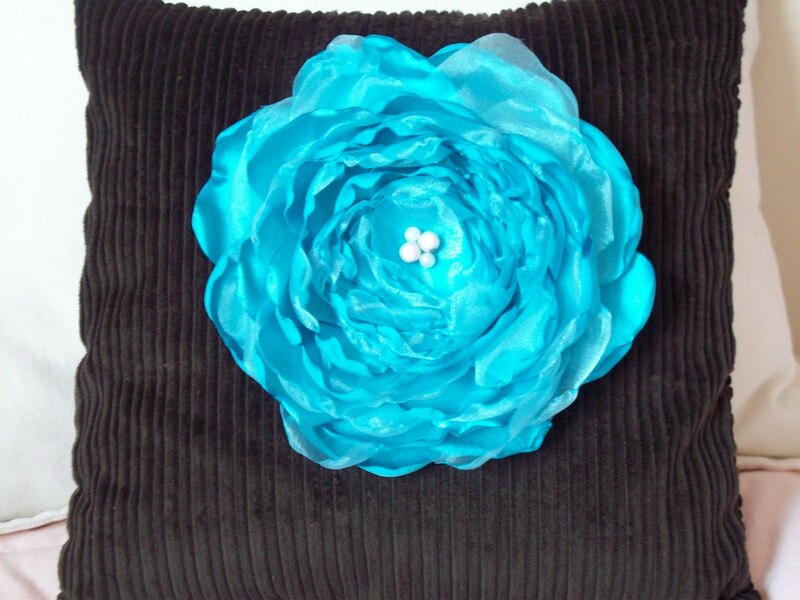 Moving on...This pillow is so elegant. 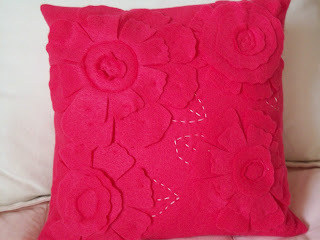 As I said the pillow is 12" square, so the flower is a good 6" in diameter. I used up $4 worth of fabric on the flower alone! It's gorgeous and full and makes a wonderful statement. I would start putting these on my bags, but I think the cost and time involved would be prohibitive. as it is though, expect to see at least a couple more of these cropping up as decorations in my own home. Here is a close up of the flower. Isn't she just luscious? I have to give a shout out to Suzanne over at Just Another Hang up. 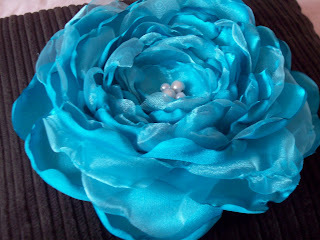 She gave me the idea for a full bodied, super size organza flower. I didn't use her pattern, because I may end up selling some of these, and I didn't want to over-step. But you should go check out her loveliness- she's really amazing. So, that's all for this outing. I'm always relieved to have another job done, and when it turns out as great as these did, well, you just can't help but smile! The blue flower one is my favorite...well done! Oh my goodness, I love them all!!! Thanks for stopping by and linking up to Thrilling Thursday @ Paisley Passions :) Hope you stop by again soon! The blue flower is my favorite too! It's gorgeous! I want one on every pillow in my house! These are all gorgeous! In love with the colorful print one! The texture is so fun! These are all really pretty!! I love the first one with the tie enclosures, very cute! 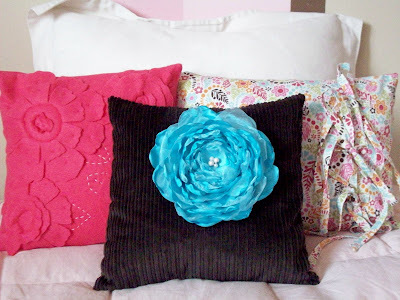 That blue flower is amazing, but I think I like the pink felt pillow the best. Nice work, Amy! Your pillows are perfect for a girls room. I love each one and I'm sure your friend's daughter does too! Yipee! I am so excited to own these little wonders!! You are amazing! Thanks again!!! The blue flower is fantastic! Your pillows are beautiful! I love, love, love the blue flower. I think I may have to attemp to make one!